Ready to learn more? Already involved in grassroots politics and want to be MORE effective? That’s what the Intermediate Guide to Grassroots Politics is all about. 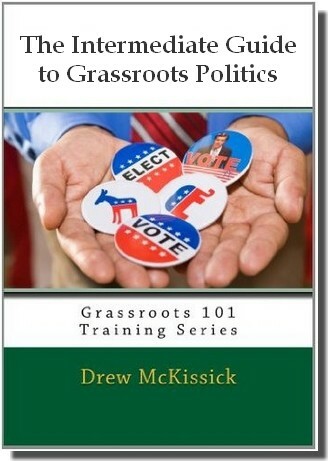 It’s Level Two of the “Grassroots 101: Grassroots Training Series“, and it’s your guide to taking it up a notch in terms of how you can get involved and be effective in local grassroots politics. Get started down the path to more effective activism today! How can you get involved and have influence in the Republican Party? What are the critical tips for new party activists? How do you effectively lobby local, state or federal elected officials? What are the best lobbying methods? What are the seven steps to effective political confrontation? How do you create legislative scorecards to educate conservative voters? How do you create effective voter guides for local elections? How do you write op-eds or letters-to-the-editor that will have an impact? Don’t wait. Start increasing your impact today! Not ready for the Intermediate Guide? Click here and check out The Beginner’s Guide now!